The Arcadia Theatre was opened around May 1931. When the Aztec Theatre opposite was renamed Esquire Theatre, the Arcadia Theatre was renamed Aztec Theatre. If you want to look at a 1907 postcard of Enid’s Loewen Theatre, click Archive page on below link, then enter Loewen. Also, enter Fort Supply Opera House to see that theatre. On the above site entered by Mr. Cox, go to Archive page, then type word “Enid”. Several theatre images can be seen in the street scenes. The Arcadia, located at 226 W. Randolph, operated from at least 1933 to 1943. It is not listed in the 1926-27 Enid City Directory and there are no other directories available at the Enid Public Library for the intervening years. 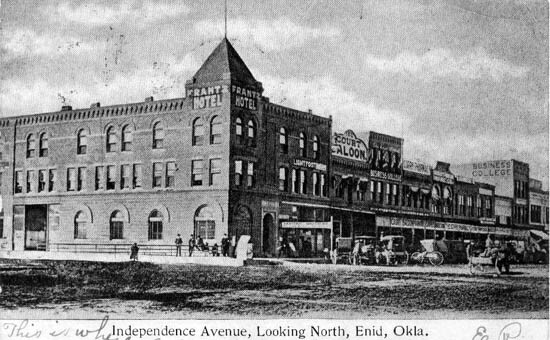 The Griffith Amusement Company (its Enid headquarters was across the street at the Aztec Theatre) ran the Arcadia at least part of the time it was open. The current occupant of the building is the Boomerang Restaurant. 1939 photo added, photo credit Oklahoma Historical Society. Via the Enid Oklahoma Old Post Cards Facebook page. 2012 article about Boom-A-Rang Diner’s opening. No mention of the Arcadia, but the wall’s artwork appears to be movie inspired. Local contractor Leroy Markes owns the building leased to Boom-A-Rang, and those surrounding it.